As a global supply chain management company for turnkey offshore casting of metal products, we have established long term relationships and completed projects with our global manufacturing partners in China. We are fully capable of managing in-house, the everyday difficulties of doing business in China. In fact, our 100% satisfaction guarantee says it all. 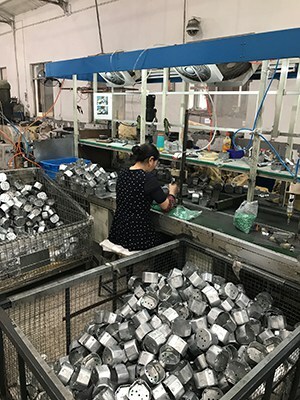 Offshore casting of metal products in China presents an array of manufacturing issues that will directly affect profits if not properly managed. Our customers enjoy the cost saving labor benefits, along with the peace of mind knowing that G&W Foundry will coordinate, execute, supervise, and expedite the production to meet the product specifications as provided by the customer. Steel, Aluminum, Brass, Alloys or as per customer requirements. 1. Machining equipment: CNC, Lathe machine, milling machine, drilling machine, grinding machine. 2. Heat Treatment: Annealing, carbonization, tempering, quench, normalization and surface tempering. 3. Surface treatment: Powder coating, chrome plating, painting, sand blasting, nickel plating, zinc plating, blacking, polishing, bluing, and others. Sample and pilot run will be given 100% inspection during production and before shipment. A sample check for mass production according to ISO standard or customer requirements will be verified. Contact G&W Foundry for your next offshore metal casting production project. When you choose our company, you are guaranteed to work with a Global leader in the industry. We will give you expert advice, and work with you to determine what is best for you.